What sensors for circuits class? What sensors are appropriate to use in a sensor-focused circuits class? I listed a bunch that I’ve been thinking about in Why teach circuits to bioengineers?, but in this post I want to focus a bit more on what criteria we should use for deciding which sensors to include or exclude. Price. We want students to be able to buy a kit of parts for the course and take everything home with them when they are done. All sensors should be under $5 (ideally under $1) each in quantities of 10. Variety of things sensed. I’d like for there to be at least 5 and preferably 8 or 9 different properties detected. Variety of different electrical properties as sensor outputs (at least current, resistance, voltage, and capacitance, maybe also inductance or mutual inductance). Some sensors should be rapidly varying (for oscilloscope output). Some sensors should be slowly varying (for recording time course with Arduino). Some sensors should require amplification. Easy breadboarding. Students won’t have time to do a lot of soldering, particularly of SMD parts. We should do one or two labs where they do some soldering, but if we use SMD parts for other labs, we’ll need to design and assemble breakout boards for them. potentiometer angle resistance 987-1277-ND 66¢ slowly time varying, hard to connect to mechanically? breathalyzer alcohol resistance 605-00011-ND $4.50 fun for students? needs humidity and temperature correction. pH probe pH voltage SeroSystems pH probe $21 Too expensive and needs temperature correction. conductance cell salinity bulk conductance ? ? May require student design and construction. Cheap with Al foil, expensive with Ag/AgCl electrodes. touch sensor touch capacitance ? ? May require student design and construction. Al foil and plastic wrap? Richard Hughey had an interesting idea for an air-flow sensor. Use one of the siren whistles for kids that cost about 50¢ each in quantity. They have a plastic turbine in them, and we could use an LED and light sensor (perhaps one of the reflectance sensors) to get a pulse stream from the turning of the turbine, timing the pulses with an Arduino. I just noticed that I don’t have any switches, accelerometers, magnetic sensors, … on that list. A breath switch might be a useful sensor for those thinking of the rehabilitation concentration. A tilt switch is also a reasonable option. A lot of the sensors I have looked at are too expensive for their value in the course, though it might be worth spending a little lecture time going over how they work. Why teach circuits to bioengineers? I’ve been posting quite a bit on the design of the labs for the new applied circuits course we are designing for bioengineering (and other) students, but I’ve not yet clearly articulated why we require bioengineering students to take a circuits course. Without a clear justification, it could be just another arbitrary hoop for students to jump through—I’m sure many of the bioengineering majors see the current circuit theory class that way. The justification for an electronics course for bioengineers can be summed up in one word: Sensors. A sensor (in this context, anyway) is a device that converts some physical or chemical property of interest into an electrical parameter: a voltage, a current, a resistance, a capacitance, an inductance, … . The purpose of an electronic circuit is to convert this electrical parameter into a numeric value that we can record on a computer or in a lab notebook (which often means going through a voltage or time representation). There are, of course, other applications of electronics, but connecting to sensors is the one that matters for bioengineers. It is very common in biological equipment these days to use a digital camera as a sensor, but the design of cameras and image processing software is outside the scope of this class. I think we want to concentrate on one-dimensional sensors that produce just a scalar value (or, more commonly, a value that varies as a function of time). So in choosing labs, I want to focus on what sensors we are using and what processing we are doing in the electronics to get a numerical result at the end. Perhaps the course should be titled something like “Introductory circuits with applications to sensors” rather than what we were considering earlier, “Circuits with applications to bioengineering”. Potentiometer-based goniometer for joint angle measurement. Useful for lead in to servo motors? Useful for control and feedback in robotics. Use of voltage divider to linearize curve and convert to voltage output. Measuring current and voltage while varying series resistor to determine whether current source or resistance model is better. 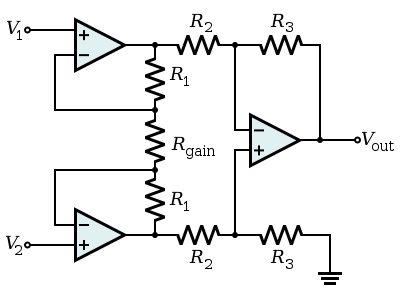 Using series resistance (voltage divider) to convert current or resistance value to a voltage value, which can be viewed on scope. 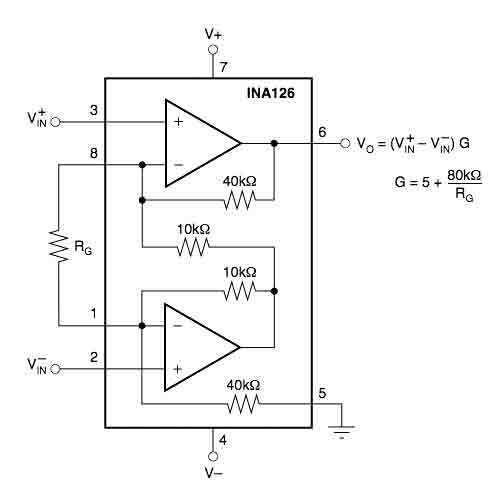 Amplifying signal to make large enough to record with analog-to-digital converter. Electrical field measurements in an electrophoresis gel. This one doesn’t fit the new theme—I think that there may be several reasons for discarding this lab. Conductivity of saline solutions. Used for measuring ecosystems (like rivers). Useful for talking about conductivity of bulk materials. Requires thought about materials for electrodes. Similar problems to conductivity of saline solution for measurement. Need recording of slowly time-varying signal. Can also be applied to other muscles (EMG) for control of robotics. May be too difficult to get good signals. Optical sensing very common in biosensors. About the simplest application of light sensing. Several different light sensors possible, with different circuits needed to convert to voltage. Uses two different light sources alternately. Appears to be a resistance measurement. Should appeal to college students. A different modality (not resistance, current, or voltage). Conversion to frequency instead of voltage. It looks like I have enough labs here, but I don’t have any direct chemical detection (other than salinity by conductance). Also, I suspect that the EKG may be too difficult to get working, and skin conductance may vary too slowly, so we may need some other time-varying signals. Since the thermistor lab seems to have worked fairly well (see More musings on circuits course: temperature lab, Buying parts for circuits course, Temperature lab, part2, and Temperature lab, part 3: voltage divider), I decided to try doing some op amp circuits today, to see how things worked. I want to get to the point where I can build a simple EKG, to see if that is feasible for a first circuits course. My playing with the op amps today reminded me why I always hated breadboards: the components are always coming loose, and I spent a lot of the time trying to figure out why things weren’t working as I expected—most of the time it was a resistor or wire not making good contact, though occasionally I had an off-by-one error in inserting a wire. Building a op amp circuit with MCP6002 chips was a little harder than I expected—the single power supply means that you need to bias the inputs to be in the middle of the range, to avoid clipping. My attempts to use the op amp to read EKG signals were a complete bust, so I went back to a simpler, stronger signal source: the electret microphone from the Oscilloscope practice lab. I got amplification easily enough, but I had trouble with clipping. After a while, I realized that the electret mic was not acting like it was a 2.2kΩ resistor, like I thought it ought to from the 2.2kΩ output impedance spec. I did a series of measurements putting a potentiometer in series with the electret mic and measuring the resistance of the potentiometer and the voltage across it (being careful to remove power before switching to resistance measurement). I then fit both a constant-resistance model and a constant current model to the data. I think that modeling the electret mic as a constant current source is a much better model than treating it as a resistor, for DC analysis. This might be a useful exercise to have students do along with the oscilloscope practice lab, as multimeter practice. The voltage across a resistor in series with the electret mic is much better modeled by treating the mic as a constant current source, rather than as a constant resistance. Since the electret microphone behaves mostly like a current source, I wonder what the 2.2kΩ output impedance on the spec means. Are there any real electrical engineers reading this blog who can explain the output impedance of an electret microphone with an FET output stage? 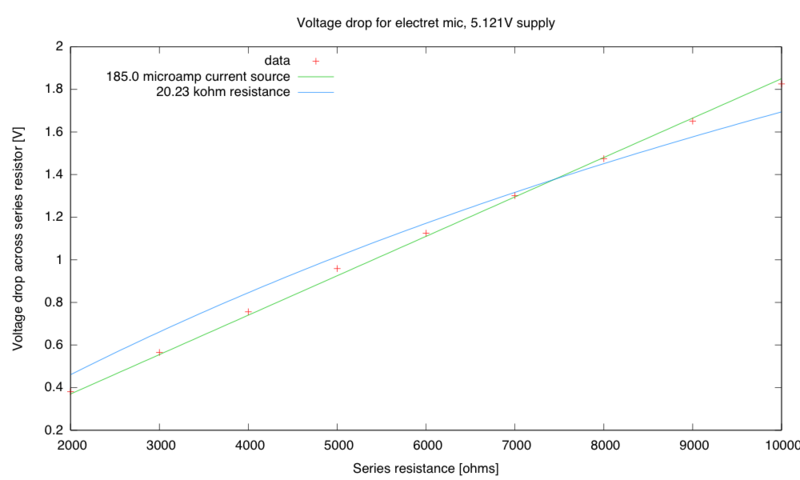 If I want to have the output of the electret mic be in the middle of a 5.121v range (that is with a DC bias of 2.56v), I’d want a 13.8kΩ series resistor. I tried using a 12kΩ pullup resistor, and it put the voltage a little above the mid-point, as expected. My initial efforts to use this signal as the input to an op-amp amplifier worked fine with a unity-gain amplifier (output directly fed back to the negative input), but whenever I tried to set a reasonable gain with a voltage divider, I got serious clipping. I finally realized that the voltage divider used for clipping had to have its bottom end tied to the center voltage, not ground (all the book examples use symmetric power supplies, so that ground is the center voltage). I made a bias voltage supply by using a voltage divider and a unity-gain amplifier, and hooked up the feedback voltage divider to the bias supply, rather than to ground. That worked fine, and I could even use AC coupling on the amplifier input with a blocking capacitor, if I added a large resistor to the bias supply for the positive input pin. 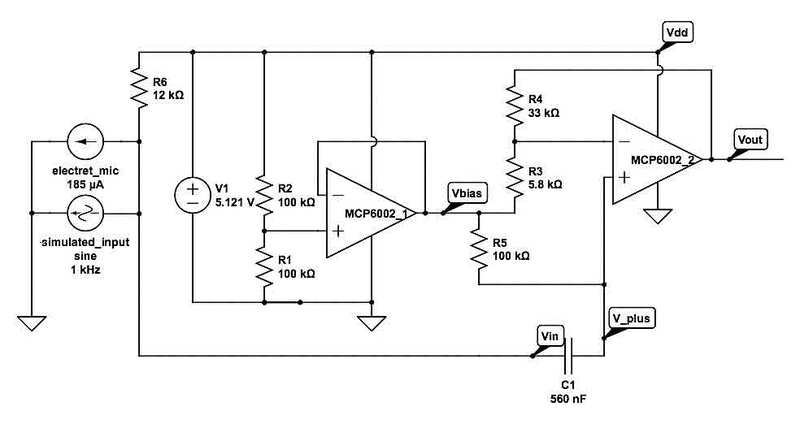 Working amplifier circuit with bias supply and AC coupling for the input. The circuit also works with DC coupling (removing R5 and replacing C1 with a wire). Circuit drawn and simulated with Circuit Lab. Once I got all the biasing issues straightened out, the op amp worked as expected (except when I jostled a wire or component loose). I did not measure the gain carefully, but it does appear to be about 6.7, as expected from the design.